There's a special type of creativity that makes art from the mundane. I love this animated stop-motion video, Deadline, by Bang-yao Liu. It was his senior project at Savannah College of Art and Design. Liu says: "where my idea comes from is that every time when I am busy, I feel not that I am fighting with my work,...I am fighting with those post-it notes and deadlines." The second video is about the making of Deadline. 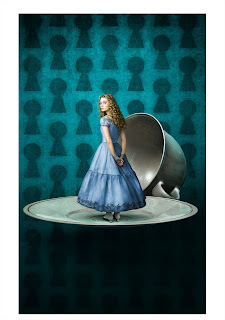 I was delighted to hear that we'll be seeing director Tim Burton's Alice in Wonderland next year. Lewis Carroll's Alice's Adventures in Wonderland (read and see the facsimile of the original book, with Arthur Rackham's illustrations, here) and Through the Looking Glass (read here) are two of my early favorite books, and anything by Burton (his most recent film was his version of Stephen Sondheim's Sweeney Todd) is bound to be, at the very least, a visual treat. 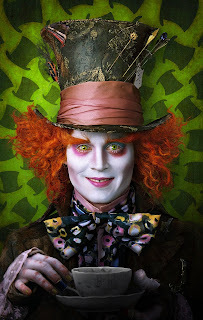 The cast includes Johnny Depp as the Mad Hatter, Helen Bonham Carter (Burton's wife) as the Red Queen, Anne Hathaway as the White Queen, Stephen Fry as the Cheshire Cat and Mia Wasikowska as Alice. 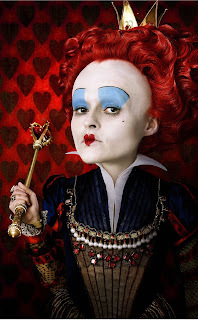 According to Burton in an article in Disney's new magazine, Disney Twenty-Three, the new film is not a re-telling of the 1865 novel, but a new story that has Alice returning to Wonderland, as a teenager, several years after the events of Alice's Adventures in Wonderland and Through the Looking Glass. He describes the movie as "kind of a mixture of some distorted live action and animation." Hmmmm. 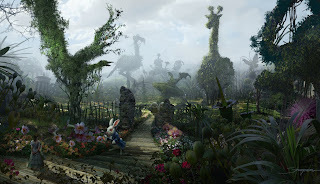 Here are a few of the images that recently were released by Disney to give a feel for Burton's artistic concept. You can find more images here and here. I'm looking forward to learning more. I wrote in this blog about Andrea Dezsö a year-and-a-half ago. I began with "How smitten am I with Andrea Dezsö?" Well, I'm even more smitten now. When I found out that Andrea was teaching at the Southeast Association for Book Arts (SABA) conference, a scant two-and-a-half-hour-drive away, I signed up immediately. I didn't even read the description of the class. 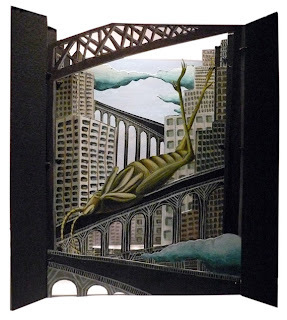 As it turned out, the two-day class covered tunnel books on day 1 and pop-up books on day 2. Andrea, whose regular day job is at Parsons New School for Design (you can see her work here on Parson's site -- including her pop-up and tunnel books), kept things simple. 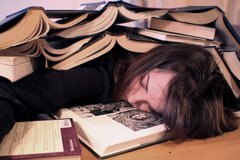 She doesn't believe in showing students how to replicate one of her books; she prefers to teach them the form and let them experiment with their own ideas. During our class, Andrea was available to guide, demonstrate, and answer questions, but made a point of not imposing her aesthetic on us. She showed us two alternatives for a tunnel book: the first was the more traditional accordion style; the other is a, simpler, wrap-around format. In the latter, each individual "screen," or portion, of the tunnel book has side tabs that are are affixed to a long strip of the same material. The strip "wraps" around the sides and back of the book. You can see some of the work our class created at the end of this post. 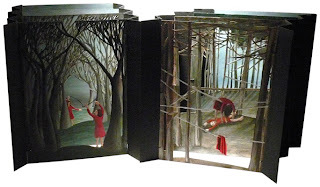 And I couldn't resist including some images of Andrea's tunnel and pop-up books. This is the first time I'd attended the SABA conference, which is organized by the Art Department at the University of South Carolina in Columbia, and held there for four days every two years. The organizers are a mix of members of the Art and English departments at USC, and they did a terrific job. Each day began with a presentation from one of the instructors, and lunch included a lecture or workshop by someone from the school -- for example, the head of the university's rare books collections spoke on what book artists can learn from such a collection's resources. A national exhibit of artists' books, Intimate Curiosities, was mounted in conjunction with the conference, juried by artist Bea Nettles (Bea also took Andrea's class) and the opening of the exhibit was held at the University's McMaster Gallery during the first evening of the conference. Magnolia trees were in full bloom in Columbia during our visit, and Andrea, who'd never seen the flowers, was immediately captivated, saying that they were "as big as a person's head!" 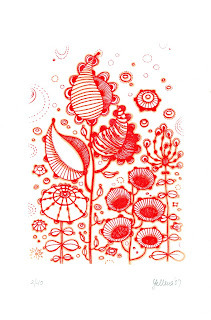 (As a side note, she made some beautiful sketches, including of the flower and its striking seed pod, during class). I was delighted with the entire experience: with the professional and still friendly way in which the conference was run, with the organizers and speakers from USC, with the exhibit, with my fellow students, and of course, with the program and the instructors (and a good word, too, for The Inn at USC, which gave us great rates, and cookies and milk every night). I'm only sorry that it comes around only once every two years. 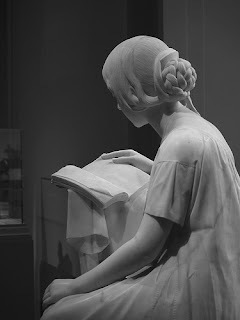 If you'll be in New York City between October 2009 and January 2010, check out the Museum of Art & Design's show: Slash: Paper Under the Knife, an international exhibit that will include Andrea's work. Magnolia bloom "as big as a person's head"
Is it just me, or are we seeing a surge of of pop-up-book art and paper-cuts art? I know we're seeing a renewed interest in and appreciation for the handmade object. Singer and songwriter Lisa Hannigan's new CD, Sea Sew, and the promotion for the disc, incorporate all three of these elements. Hannigan hails from Ireland, and sang backup for Damien Rice before being fired by him after seven years (see this NPR interview). The central image for the web site for Sea Sew is a piece of knitting by Hannigan's mother. 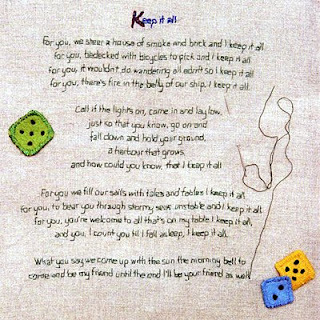 The original liner notes (song lyrics), photographed and included in the CD package, were hand-embroidered by Lisa (see the lyrics for Keep It All above). 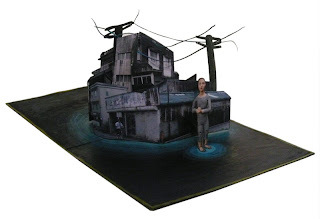 The song Lille -- the first of the two videos below -- is illustrated by pop-up imagery. That's Hannigan turning the pages. The pop-ups are by Maeve Clancy and Jamie Hannigan. The second, I Don't Know, has Hannigan literally "cutting-and-pasting" a room for herself (also created by Clancy). You can buy the album here and here. I love both of the songs and videos and have been playing them all afternoon. Hannigan's blog entry for March 10, 2009 recounts her appearance on The Colbert Report. Catch that interview and performance here and here. Image credit for Keep It All lyrics (above): ATO Records. Thanks to Blue Roof Designs for the heads-up. I bought a Gocco (from a Japanese word loosely translated as "make-believe play") more than a year ago, and I've yet to use it. Mind you, when I learned that the manufacturer was going to stop making Gocco and shipping supplies to the U.S. in December 2008 (see here and here), I stocked up on inks, screens, and bulbs in a panic. But, nooooo, that didn't motivate me to actually use my Gocco. The Gocco and the supplies still sit on my shelf, untouched. I don't know about you, but I'm pretty visual when it comes to learning how to make something. But I also need to hear the instructions -- for some reason, visuals without words don't seem to take -- so the best combination for me is both hearing the instructions and seeing the action. So I was delighted when I came across this video (below) from Etsy Labs on YouTube. 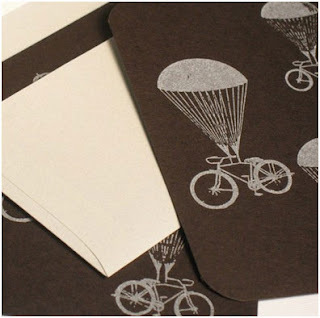 Not only does it promise that Gocco printing is insanely simple, but it shows this to be really, truly so. So for all of you who have been procrastinating about making Gocco prints (to use in your books, natch), you have no excuse now (I'm saying that to myself as well as to you). Get out your Gocco and print!